I love chocolate: receiving it, eating it, and collecting it. When I was a kid, I saved the chocolate wrapping foils that I ate and kept them in my books. There wasn't really a lot as back then food didn't come plentiful. And the most fancy chocolate I had probably was Ferrero Rocher. Recently I like to collect flower-infused chocolates, like lavender, sumbucus and rose. Sometimes I'd wrap it with hand-made flower petal paper, place a small dried flower bouquet on top, give it to my best friends as a gift. 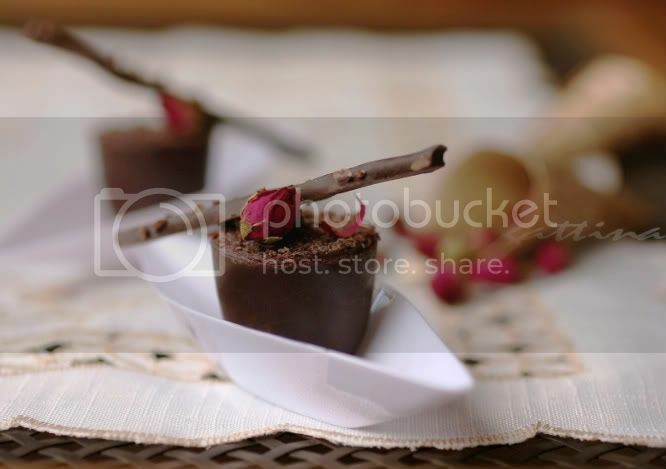 But more often the chocolate goes straight to my tummy :) :) Today I have time to elaborate it to an elegant petit four. 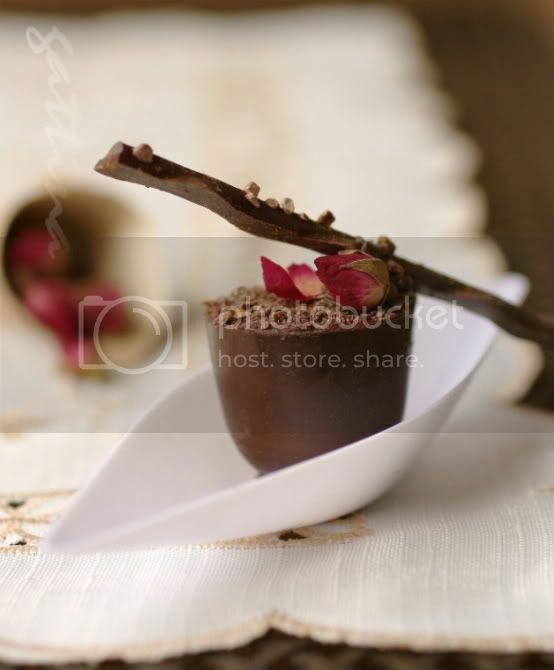 I cooked the rose-infused chocolate with cream and butter, then poured into (store-bought) dark chocolate cups, topped with chocolate shavings, dried roses and almond chocolate stick to finish. this is really cool and beautiful! nice pictures! What a beautiful dessert! I love the pretty presentation. beautiful picture, love your presentation.